Illustrations: 14 b/w photographs, 7 maps. Jerusalem is more than a holy city built of stone. Domain of Muslims, Jews, and Christians, Jerusalem is a perpetual contest, and its shrines, housing projects, and bulldozers compete in a scramble for possession. Now one of Jerusalem's most respected authorities presents a history of the city that does not fall prey to any one version of its past. Meron Benvenisti begins with a reflection on the 1996 celebration of Jerusalem's 3000-year anniversary as the capital of the Kingdom of Israel. He then juxtaposes eras, dynasties, and rulers in ways that provide grand comparative insights. But unlike recent politically motivated histories written to justify the claims of Jews and Arabs now living in Jerusalem, Benvenisti has no such agenda. His history is a polyphonic story that lacks victors as well as vanquished. He describes the triumphs and defeats of all the city's residents, from those who walk its streets today to the meddlesome ghosts who linger in its shadows. Benvenisti focuses primarily on the twentieth century, but ancient hatreds are constantly discovered just below the surface. These hostilities have created intense social, cultural, and political interactions that Benvenisti weaves into a compelling human story. For him, any claim to the city means recognizing its historical diversity and multiple populations. A native son of Jerusalem, Benvenisti knows the city well, and his integrated history makes clear that all of Jerusalem's citizens have enriched the Holy City in the past. It is his belief that they can also do so in the future. 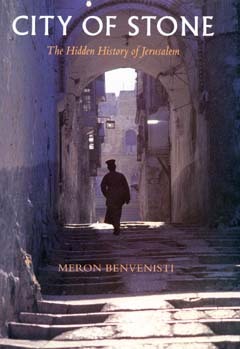 Meron Benvenisti is a former Deputy Mayor of Jerusalem and the author of numerous books, including Conflicts and Contradictions (1986) and Intimate Enemies: Jews and Arabs in a Shared Land (California, 1995).